CAIR is suing Texas because it believes that Texas should be anti-Semitic -- and the Lone Star state passed legislation that it's not. That's quite an admission of its true colors on CAIR's part. Yet today, the Council on American-Islamic Relations (CAIR) is announcing a lawsuit against the state of Texas for passing anti-BDS legislation last year. BDS stands for the boycott, divest and sanction movement against Israel which aims to strangle the Jewish state economically while at the same time calls for the flooding of Palestinians into Israel to destroy the Jewish character of the state. This is fundamentally because the movement "[applies] double standards by requiring of [Israel] a behavior not expected or demanded of by any other democratic nation." For example, there are at least 100 land disputes across the globe that are not subject to "BDS" movements. In their law suit against the state of Texas, CAIR says Texas' anti-BDS legislation infringes upon their First Amendment rights. This is a breathtaking claim when one stops for a moment and applies this accusation to its logical conclusion. First we must ask: How is legislation against anti-Semitism an infringement on their rights? What CAIR is really saying by this lawsuit is that CAIR feels that this legislation against anti-Semitism infringes on their right to be anti-Semitic! We should note that while it is every individual's right in the U.S. to hold and express their opinions no matter how despicable they are (as long they do not lead to immediate violence), this is a far cry from an organ of the government expressing such views or acting in an illegal way by doing so. In addition to adopting the International Holocaust Remembrance Alliance's definition of anti-Semitism (which defines the BDS movement as anti-Semitic), the U.S. constitution stipulates that it is illegal to discriminate based on religion. Thus, the United States government has made its legal opinion known on the worldwide scourge of anti-Semitism. 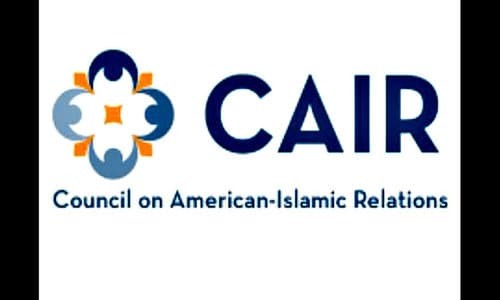 CAIR calls itself as a "Muslim civil rights and advocacy organization" and purports to speak for all Muslims (although a 2011 Gallup poll found that less than 12 percent of Muslims felt that CAIR represented their interests). In truth, CAIR speaks for Islamist supremacists - those Muslims who believe that sharia law should be enacted as a worldwide system of government. We can assume that CAIR thinks that included in those "Palestinian rights" is the right to terrorize and murder Israeli citizens as well as support terror groups like Hamas whose mission is to do just that. CAIR was designated as an unindicted co-conspirator in the largest terror-funding trial in U.S. history. The trial found executives of the Holy Land Foundation guilty of funneling millions of dollars to Hamas in 2008. Despite a legal appeal launched by CAIR to have this status changed, the next year, a U.S. district court upheld CAIR's designation as an unindicted co-conspirator because of "ample evidence" linking it to Hamas. In fact, in November 2014, CAIR was designated as a terrorist organization by the United Arab Emirates along with a host of other Muslim Brotherhood-linked entities. Islamist anti-Semitism is not a new phenomenon. However, CAIR, along with other Islamists, have worked overtime to create a new strategy to introduce this long-standing bigotry into mainstream discourse. They have done this through creating the "Islamophobia" narrative. This narrative serves two purposes: First, it asserts that Muslims are victims of racism, which, second, primes the way for shutting down any conversation challenging the Islamist ideology. Once Islamists established that that Muslims were a privileged group (because of their victimhood status), they went about making alliances with other victim-status groups. Anti-Semitism has now become the rallying point for grassroots political movements from the far Left to the far Right. From Linda Sarsour and her Farrakhan-supporting co-founders of the Women's March to the Yellow Vests in France, who joined with the Islamists this weekend to blame the country's ills on the Jews, it is quite easy to bring out this ancient canard as a rallying point. CAIR's latest tactic should be outed for what it really is: blatant anti-Semitism. It should also be pointed out that sixteen likely candidates for the Democratic presidential nomination in 2020 have been endorsed by CAIR.